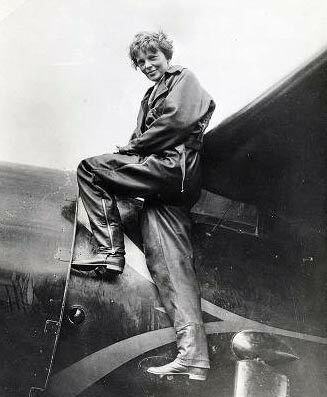 Amelia Mary Earhart was an aviation pioneer who became the first woman to fly solo across the Atlantic. She set many solo flying records and wrote several successful books about her experiences. She was a supporter of equal rights for women and saw her role to inspire other women and give them confidence that they could achieve the same as men. In 1937, aged just 40 years old, Amelia Earhart disappeared over the Pacific Ocean on a solo flight attempting to circumnavigate the globe. 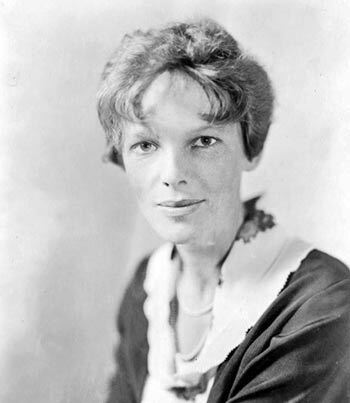 Amelia Earhart was born in Atchison, Kansas. Her father was a lawyer and her grandfather a former federal judge, and leading citizen of Atchison. From an early age, Amelia displayed a great sense of adventure and was often referred to as a ‘tomboy’. She enjoyed pursuits not common for girls of her age – such as shooting rats with a rifle, climbing trees and keeping wildlife such as worms and a tree toad. Her mother encouraged a greater freedom for her children that wasn’t common for the time. Her mother once commented that she didn’t believe in bringing up her children to be ‘nice little girls’. This spirit of relative freedom and adventure was a common trait throughout her life. In 1909, Amelia and her sister joined her parents in Des Moines, Iowa, where he father was now working for the railroad company. Unfortunately, her father was diagnosed as an alcoholic, and later he lost his job. In 1915, the family moved to St Paul, Minnesota, before shortly having to move on again to Chicago. In her young years, Amelia was educated at home. She was a keen reader and kept a scrapbook of women who had made significant achievements in fields that were at the time primarily the preserve of men. After moving to Chicago, Amelia tried to find a school with good science teaching, but she was disappointed by what was on offer, and her education proved a disappointment. In 1917, she trained as a nurse and began volunteer work in the Spadina Military Hospital for wounded soldiers from the Western Front. In 1918, she contracted the Spanish flu, while working as a nurse in Toronto. It took her a year to recover and left her with chronic sinusitis, which adversely affected her flying. Around 1919, she had her first major flying experience watching a display by a World War 1 ace. She commented that something captivated her about flying and she developed a deep-seated desire to fly. On December 28, 1920, she had her first flight with pilot Frank Hawks. She said. Working in a variety of jobs, Amelia saved up money to be able to pay for flying lessons. In 1921, with help from her parents, she was able to receive flying lessons from Anita Snook, a pioneer female pilot. By 1923, Amelia was the 16th women to be issued a pilot’s license. By 1927, she had accumulated 500 solo hours flying. This was quite an achievement given the rudimentary state of early aviation. A pilot had to be good with manual controls but also adept at navigation and securing a safe flying route. Together they had no children, though George had two children from a former marriage. In 1927, Charles Lindbergh became the first person to fly solo across the Atlantic. Shortly after, Amy Phipps Guest offered to sponsor a female who might be willing to undertake the flight. In 1928, she accompanied pilot Wilmer Stultz on a 20-hour flight across the Atlantic to England. This flight received a significant deal of media attention and made Amelia a public figure. She was sometimes referred to as Lady Lindy; this led to profitable marketing opportunities with a cigarette company ‘Lucky Strike’. Her new found image enabled her to become involved in the design of female fashion, focusing on simple, natural lines which were also practical to wear. Her image as a successful pilot also played a role in raising the profile of air travel for ordinary people. The 1930s was the real beginning of commercial air travel. She also used her image to support women’s groups, especially women’s groups dedicated to flying such as the Ninety-Nines. She became friendly with Eleanor Roosevelt, who shared a similar outlook on human rights and female equality. With support from Purdue University, Earhart began plans to make a challenging 29,000 mile global flight around the equator. It would not be first flight to transverse the globe, but it would be longest staying close to the equator. She had a Lockheed Electra 10E – built to her specifications. For part of the flight, she would be joined by Fred Noonan, an experienced navigator. 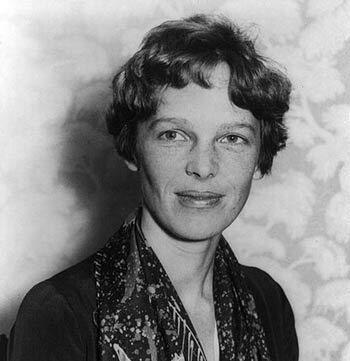 By late June 1937, Earhart and Noonan had travelled from Miami to South East Asia and Lae, New Guinea. On July 2nd they took off from Lae intending to go to Howland Island. However, on their approach to Howland Island, there were radio messages that they were running low on fuel. Contact was lost, and the plane never made it to their destination. Despite an extensive search for the plane, they couldn’t be found, and they were presumed dead in absentia. The most widely accepted theory is that they ran out of fuel and had to ditch the plane in the sea. Others claim they may have made it to Phoenix Island. Speed record for east-to-west flight from Oakland, California to Honolulu,Hawaii (1937)President Herbert Hoover presented Earhart with a gold medal from the National Geographic Society.Congress awarded her the Distinguished Flying Cross-the first ever given to a woman.